International program: the language of instruction is English (proof of adequate English knowledge required; knowledge of German not required). Program duration: 4 semesters, 120 credit points (ECTS). Full-time program. Starting in the program is possible only in the winter term. Final degree: Master of Science (M.Sc.). 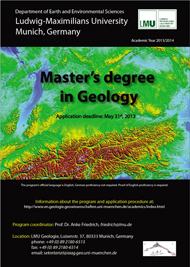 The new international Master's Degree Program in Geology is offered by the Department of Geo- and Environmental Sciences at the LMU Munich and the Munich GeoCenter. Courses include lectures, seminars, practical exercises, and field work. Master's theses are research-oriented, and the final degree is awarded only after completion of both thesis and thesis defense. The program is full-time only, part-time enrollment is not possible. The general application deadline is May 31st every year for the program starting in the winter semester of the same year. Non-EU students are however strongly advised to apply by February 15th, and EU students from outside Germany by March 31st. To apply, please follow the link to "Application and Registration" in the list below. Application requirements are generally the same for all applicants, regardless of nationality or Bachelor degree-granting institution (including LMU Munich). Those few exceptions that concern exclusively international students (e.g. some specific certificates) are clearly noted whenever they occur. If no exception is noted next to the document or requirement, it applies to everyone.